How do I download and print my provisional marks and feedback from Turnitin? You can download and / or print your provisional marks and feedback from Turnitin Feedback Studio. 1. Log in to MyBeckett and enter the module containing your assignment. In the Submissions Inbox, click the title of your paper. 2. 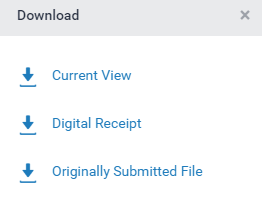 On the right of the screen, click the download arrow icon. 3. Click Current View from the list of download options. 5. Open the PDF. Your feedback is located on the last few pages. 1. Click the downloaded file to open it. You’ll need some PDF reader software. If you’re on Campus, the software’s already installed. If you’re off Campus, download Adobe Acrobat Reader. 2. When the file opens, you can print it. Click the File menu at the top of the page. 4. A print settings box appears. Select a printer and any other options (pages, copies etc. ).